The EUR/USD pair witnessed a rather lacklustre trading action and remained confined in a 25-pips narrow trading band at the start of a new trading week. The pair did post modest intraday gains but once again failed to clear the 1.1320 immediate supply zone. Meanwhile, the downside remained cushioned amid persistent selling pressure surrounding the US Dollar, which added to its recent losses and was further weighed down by the US President Donald Trump's latest criticism against the Fed's policy tightening. The greenback was further pressurized by firming risk sentiment amid more optimism over the US-China trade deal, especially after reports that the US negotiators have softened their stance on China's industrial subsidies in an attempt to reach a trade deal. On the economic data front, the NY Empire State Manufacturing Index jumped to 10.1 for April and surpassed consensus estimates pointing to a reading of 6.0, though did little to provide any respite to the USD bulls. The pair, however, failed to capitalize on the intraday uptick and finally settled near the 1.1300 round figure mark, forming a Doji candlestick on the daily chart, suggesting indecision. The pair extended its sideways price action through the Asian session on Tuesday as market participants now look forward to the release of German ZEW survey for April for some short-term trading opportunities, though seems unlikely to provide any meaningful impetus ahead of more relevant macro data from the Euro-zone and the US on Thursday. 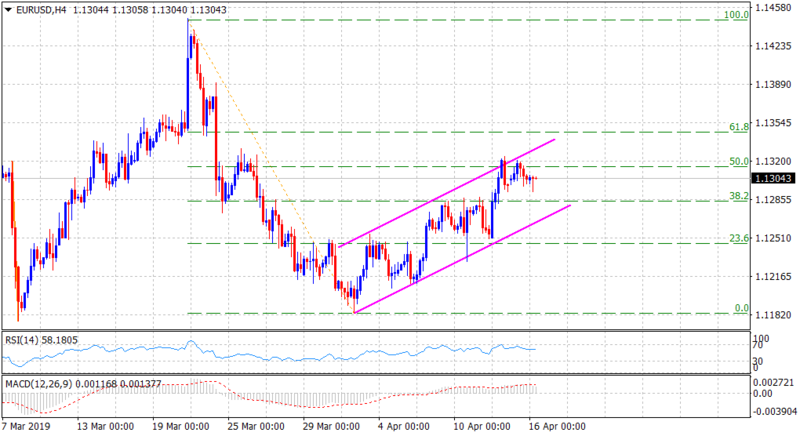 From a technical perspective, the pair has been struggling to make it through a confluence hurdle – comprising of the top end of a short-term ascending trend-channel and 50% Fibonacci retracement level of the 1.1448-1.1184 recent downfall. Hence, it would be prudent to wait for a sustained move beyond the mentioned barrier before traders start positioning for any further up-move towards reclaiming the 1.1400 round figure mark with some intermediate resistance near 61.8% Fibo. level, around mid-1.1300s. On the flip side, weakness below the 1.1290-80 region (38.2% Fibo. level) now seems to find decent support near the lower end of the trend-channel, currently near the 1.1265 region, which if broken might turn the pair vulnerable to slide further below 23.6% Fibo. level, around the 1.1245 area, towards challenging the 1.1200 round figure mark.